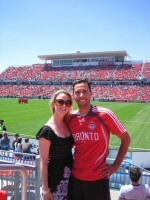 This past Saturday my brother took me to my first ever Toronto FC game at the BMO field. After a grueling hour or so in the heat ( Im talking about sitting in the stands- I can only imagine how the players feel! ), Toronto won against the Colorado Rapids, 1 to nothing. Go Toronto! While there, who did I spot? Why the SOB himself – Chris Molder. Chris has handled many of my client’s mortgage needs. You can visit him at his site at www.sonofabroker.com.